For the cake: Preheat the oven to 160°C / 320°F / gas mark 3. Beat the butter, sugar, lemon zest and vanilla in an electric mixer until light & fluffy. Gradually beat the eggs in one at a time, beating well after each addition, and sprinkling in a tablespoon or so of the flour after you have added the second egg (this stops it curdling). Gently fold in the flour, the ground pistachios and almonds, and keep folding until there is no sign of the flour. Spread the batter evenly over the base of the tin and bake until firm to the touch and a skewer comes out clean with a few crumbs stuck on it for between 50-55 minutes in the preheated oven or 40-45 minutes in the baking oven of the Aga using the cold plate when it starts to brown and foil in the oven. This is important, as the baking oven is warm and you might also need to use foil if it browns too fast. When baked, remove from the oven and leave to cool completely before running a knife around the sides of the cake to loosen and turning out. For the glaze: Gently warm the sugar, juice and zest, bring to the boil, and then simmer until slightly thickened and syrupy. 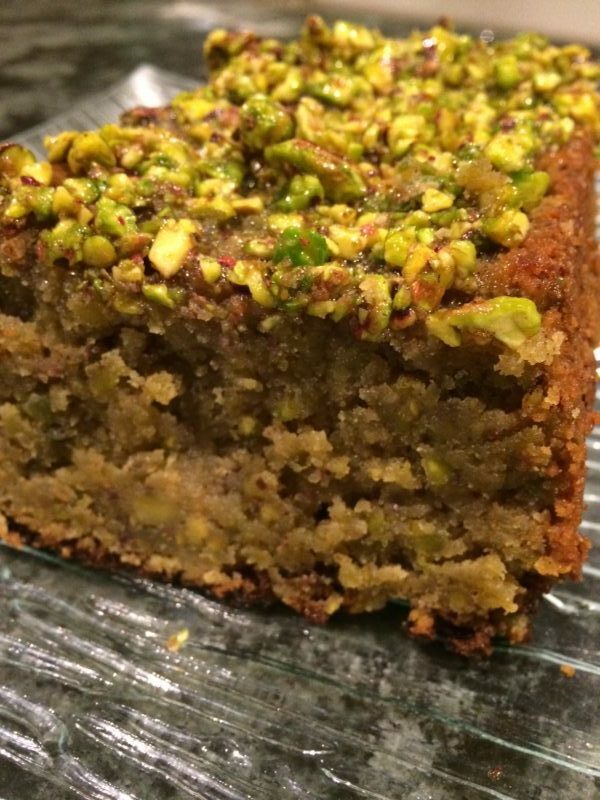 Stir in the pistachios then pour evenly over the cake. Serve the cake in thick slices with a dollop of rose cream. You can make the cake up to a day ahead: cool completely before storing at room temperature in an airtight container. This cake is also very pretty baked in a cake tin – butter and line a 24cm springform cake tin and bake for about 40 minutes.